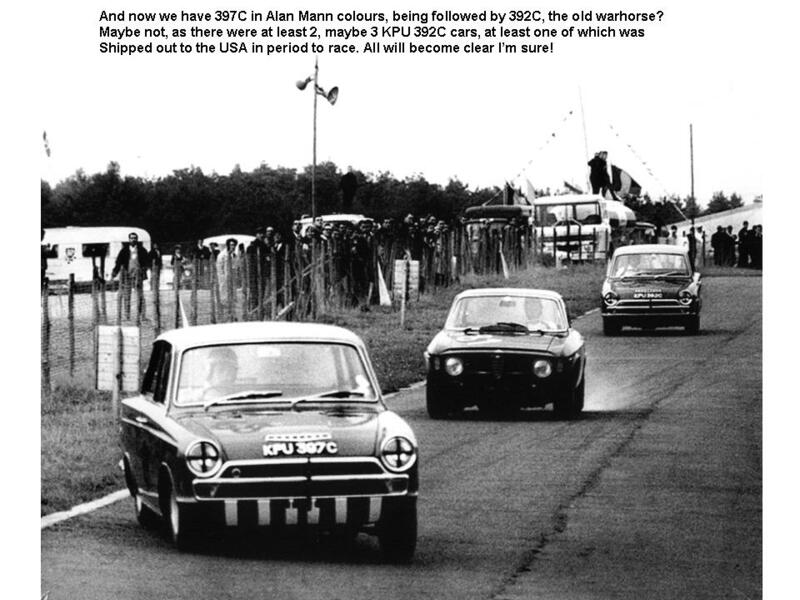 The Alan Mann Race (AMR) team were the other string to Ford’s racing bow for the Lotus Cortinas, along with Team Lotus. Whilst Team Lotus were focused on the British Touring Car Championship (BTCC) in the UK, AMR had the European Touring Car Championship (ETCC) across Europe, including the UK. For 1964, AMR campaingned 2 cars : BTW 297B driven by Sir John Whitmore, and BTW 298B usually driven by Henry Taylor, but also by Jackie Ickx, Peter Proctor and Jackie Stewart. Both these cars were in the standard livery of white with green stripe. The first race was in May 1964 at Zolder, and AMR came in 1st and 2nd overall. The highlight of the year was the Brands Hatch 6 hr in June, when again, AMR came in 1st and 2nd. 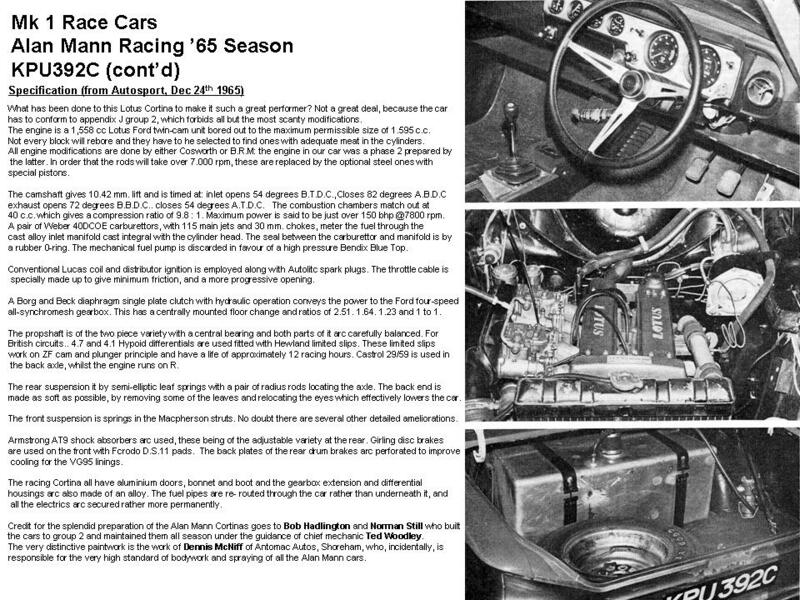 Alan Mann wrote in his book that the cars probably couldn’t have completed another couple of laps, such was the state of the back axles in both cars! In July 1964 AMR were invited to enter the 24hr Spa Francorchamps race, along with 2 standard Lotus Cortinas entered by Ford of Belgium. AMR built two new cars for this race, EHK 489B and EHK 490B. Aagin, both of these cars were white with a green stripe. They knew that the cars wouldn’t last 24hrs due to the weakness of the back axle, so decided to ‘go for it’ and put on a good show for as long as they could. The cars lasted longer than they expected, but both retired, one with a failed clutch, and the other with a blown engine. It was during the 1964 season that Alan Mann decided to make his cars ‘stand out from a sea of white and green stripe Lotus Cortinas’, which were becoming quite numerous as the year progressed. He decided on a scheme that wouldn’t be too easy to copy, and created the Ferrari Rosso Red with gold stripe and gold roof livery, but it wasn’t to be seen until well into 1965. AMR didn’t win the championship in 1964, but made a very credible debut for the Lotus Cortina. 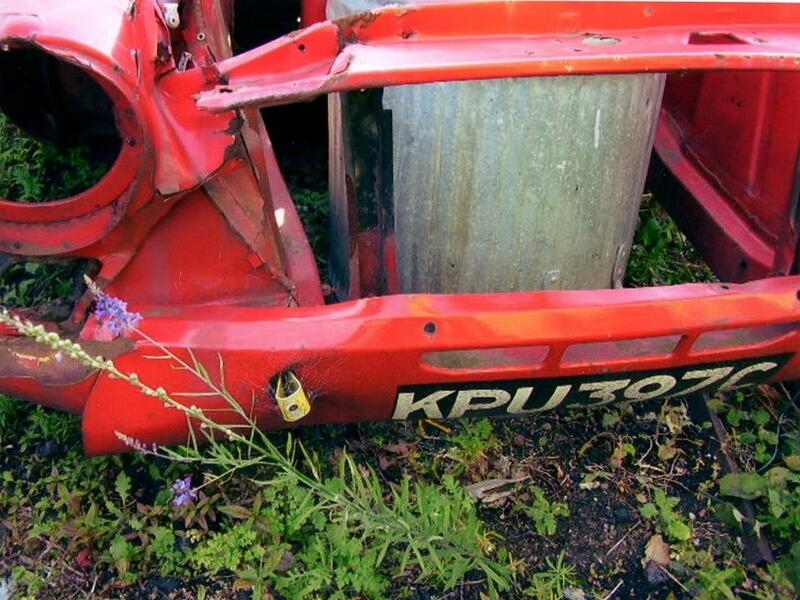 The 1965 season carried on with the 1964 cars, still on their ‘A’ Frame suspension, and it wasn’t until June 1965 that the Lotus Cortina was homologated with leaf springs, and many ‘KPU’ cars were registered by Ford for press, rally and race activities. The following were registered to Alan Mann. Some were used in 1965, and some in 1966. The main leaf-spring car campaigned by AMR was KPU 392C, driven by Sir John Whitmore, who won the championship in 1965. There were nearly always two AMR cars entered for each race, but currently I cannot tie down a specific registration number to any race for the second car. I have two photos (below) which may indicate the registration of the other car or cars. One is of KPU 397C in white and green, with KPU 388C, also in white and green. The other shows KPU 397C in red and gold, followed by KPU 392C, also in red and gold. I acquired these two photos quite a long time ago, and on the back is written ‘AMR racing Team’, but that’s all. What is for sure is that all the AMR Lotus Cortinas came out of the factory as white with a green stripe, and were overpainted by AMR. 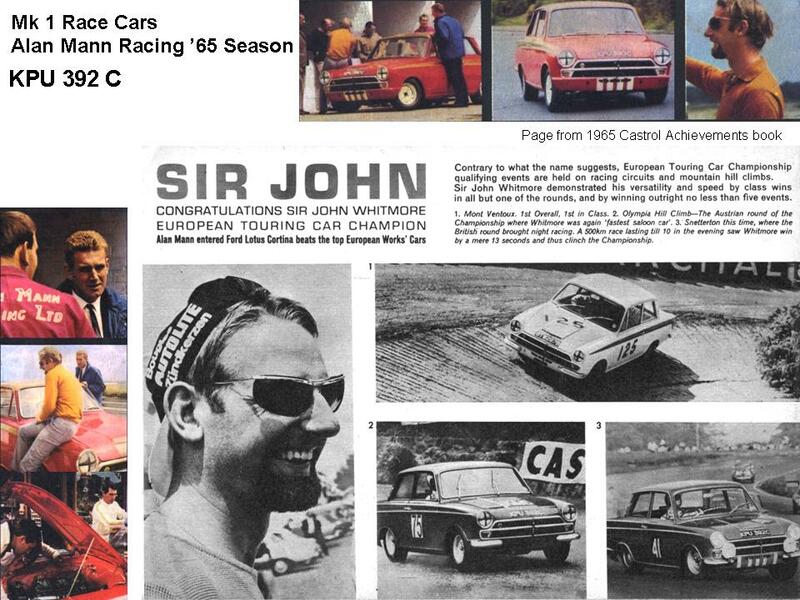 They didn’t come out as red cars, as did the Boreham rally cars. There are two more cars that are known to have been registered at the same time by Ford and used by Alan Mann and these were KPU 390C and KPU 391C. 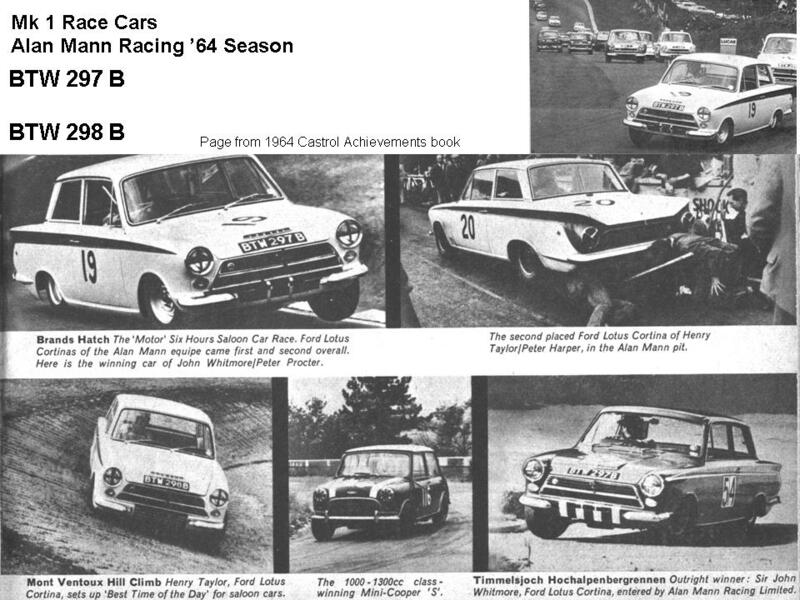 These were certainly raced in 1966 by AMR in the ETCC, with many photographs found, but it’s currently unknown if they did any work in 1965 as well. 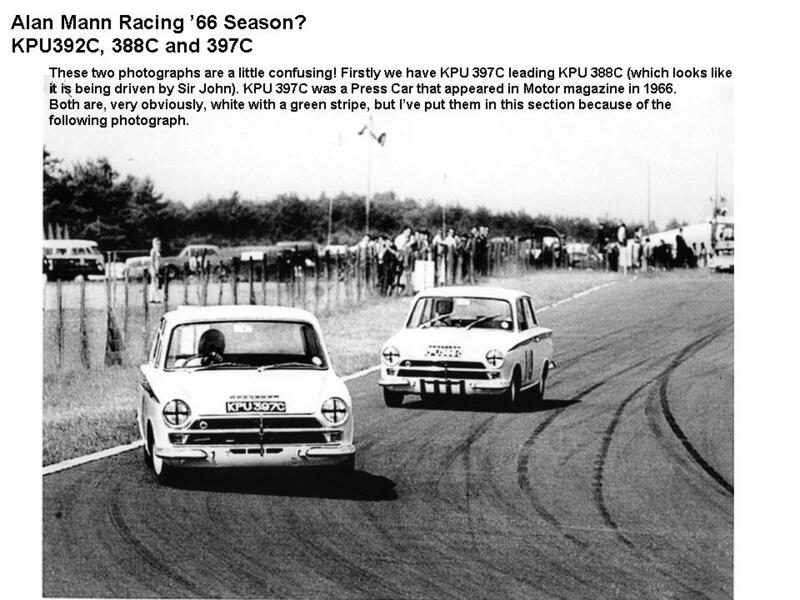 It seems unlikely that KPU397C was raced in 1965 as it was a converted Press car, still in use as such in early 1966. So, it’s complicated, and it gets worse! In 1966, AMR sends three of it’s cars out to the USA to run in the Trans Am Series. 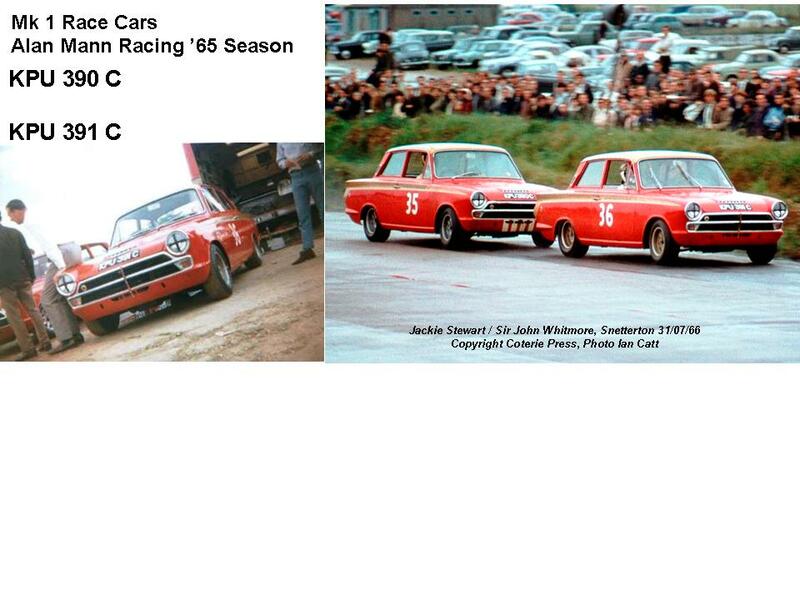 As 390, 391 and 397 definitely ran in the 1966 ETCC, it is probable that it was 392 and 388 that were sent to the USA. But the third one? If you have any further information to clarify the above, please get in touch.